It's hard to believe that they all start out so small. Find out what criteria you can think through to make the best decision for you and your family regarding size. 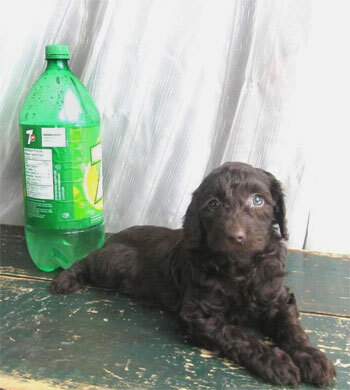 How do you decide which size of Australian Labradoodle is right for your family? How big is my back yard? How active are we as a family? Do we swim, hike etc. How involved do I want to be in facilitating my dog to get in and out of the car? Do I want my dog to sit on my lap and cuddle with me or sit at my feet on the floor? Do I want my dog to travel with me? How big is my vehicle? The answers to these questions point to the size of dog that would be best for you. Obviously, Standard Australian Labradoodles will keep up in a long run better than a miniature Labradoodle. But a miniature Labradoodle can still be active and join your family in their walking and hiking and even swimming activities. You just need to be aware of how much they can do and when they need to rest. Miniature Labradoodles will be able to snuggle onto your lap but it's much harder to cuddle with a 100lb dog in the same way. Standard Labradoodles need more space - in the yard and in the car. Will your facilities accommodate that kind of space or will a medium or a miniature Labradoodle be a better fit for your family? If you have a smart car and a small apartment, I would suggest a medium or a miniature Labradoodle, but if you have a large house, you can look at all sizes. Currently there are three official sizes of Australian Labradoodles according to the Australian Labradoodle Assoc. Although there are three recognized sizes of Australian Labradoodles, there can be some variations within these three categories. A medium small is about 30 lbs and a medium large that will be closer to 40 lbs. The medium itself will be in the middle at about 35 lbs. Here at Great Plains Labradoodles raise a variety of puppy sizes from Mini - Med - Med/Large and we would be more than happy to help you decide which size is best for you!